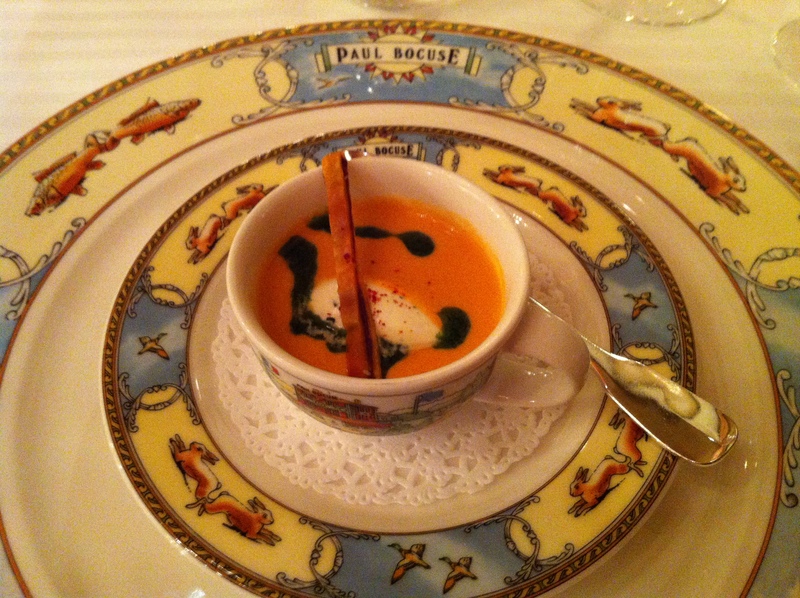 Homage to Paul Bocuse at l’Auberge du Pont de Collonges | 15,000kms of Food! We were in Lyon, and had to pay our respects to the legendary Paul Bocuse by visiting his restaurant Auberge du Pont de Collonges. I knew what I was in for when I made the booking, which was a restaurant and menu that had not changed since 1975. And yep, it was exactly what I got. Rich, luxurious, scrumptious and excessive food! Since I’d gone all the way there, and the chances of returning are fairly slim, I’d decided to go all out and have the Menu Grande Tradition Classique. Seven courses, which included a whole Bress chicken and dessert trays that you could select anything from. Just a small piece of advice if you ever go there: make sure you’re hungry! Before we started, we had the customary amuse bouche which was a lovely bisque. 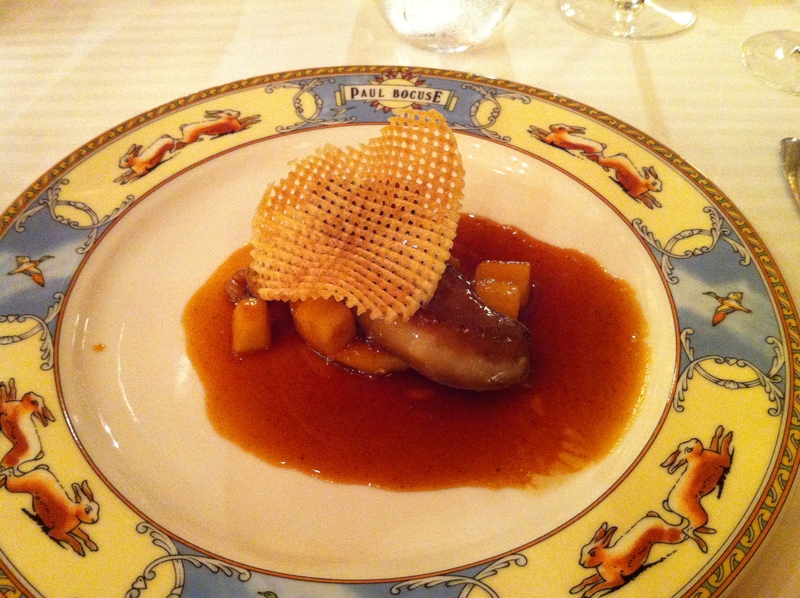 First course was “scallop of foie gras, pan-cooked, verjus sauce“. The foie gras was beautifully seared on the outside and soft inside, and it was served with crispy potato lattice on top and a sweet sticky sauce. 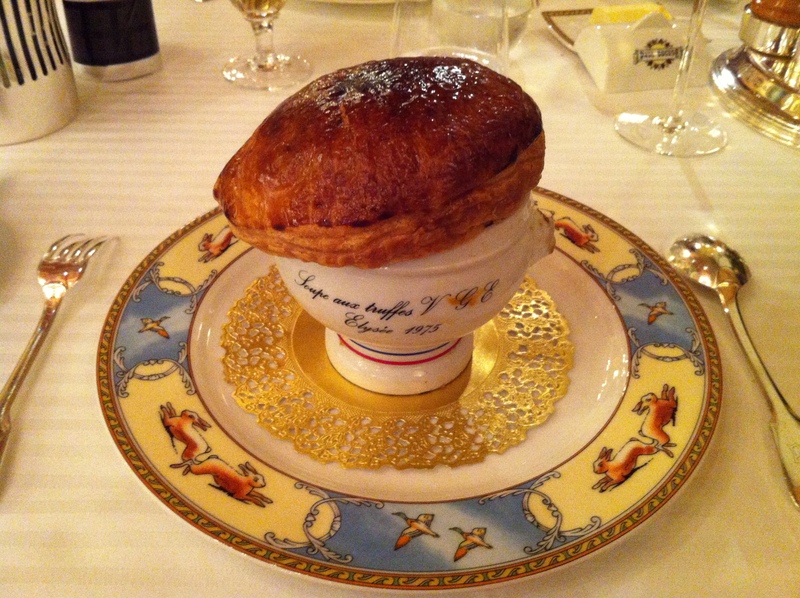 Next up we had the famous “Truffle soup V.G.E.” which was a dish created for the French President in 1975. A dish that has been around for over 35 years must be good to stand the test of time. I’d expected a thick soup under that puff pastry but it was actually a clear soup with veges and truffle. Be warned: a bowl of this soup was $82 euros! 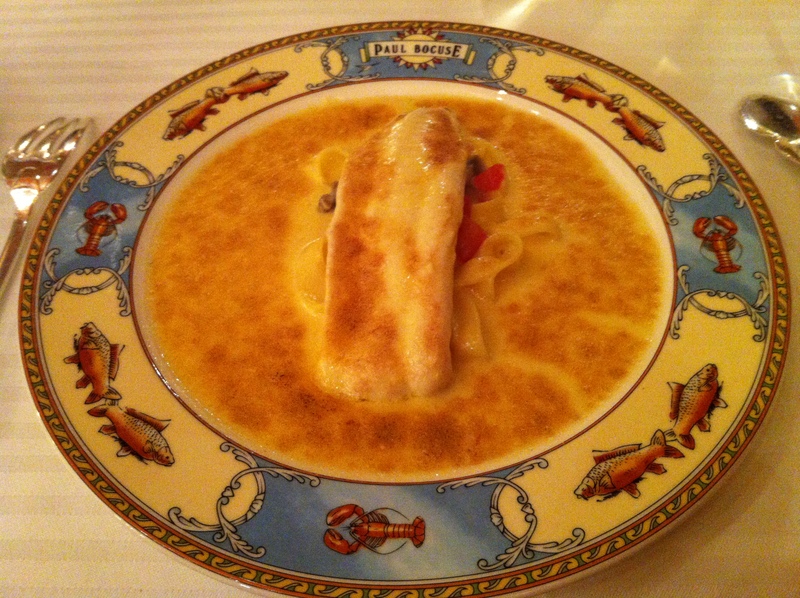 The “filet of sole with noodles, à la Fernand Point” was devine! Lovely soft and sweet sole with a creamy white sauce (which had been lightly grilled to give it that browned taste) with noodles. 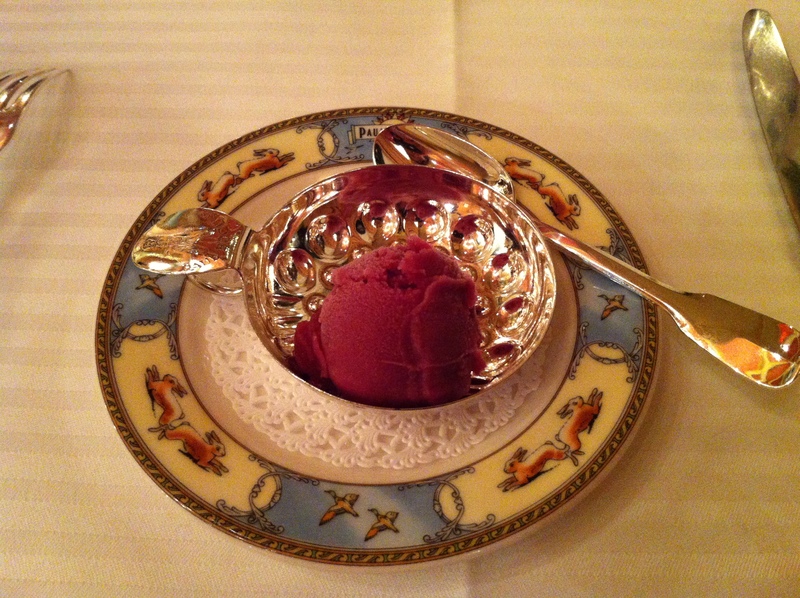 We then had a palate cleanser which I thought was worthy of mention: “Beaujolais winemaker’s sherbet“. It was like icy red wine – really powerful and unexpected. 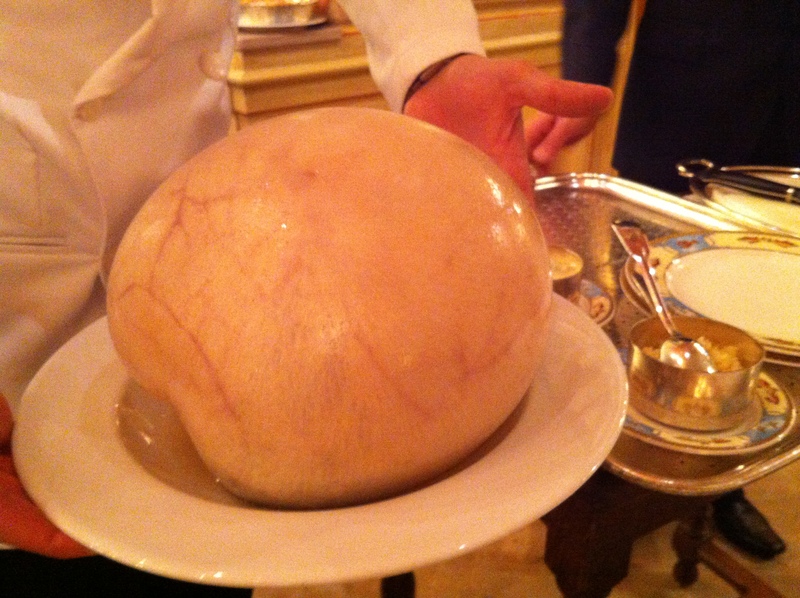 Next we were served a whole “Bresse chicken truffled cooked in a bladder“. It’s quite scary looking (a chicken in a bladder that’s puffed up from the steam whilst cooking) but really delicious! 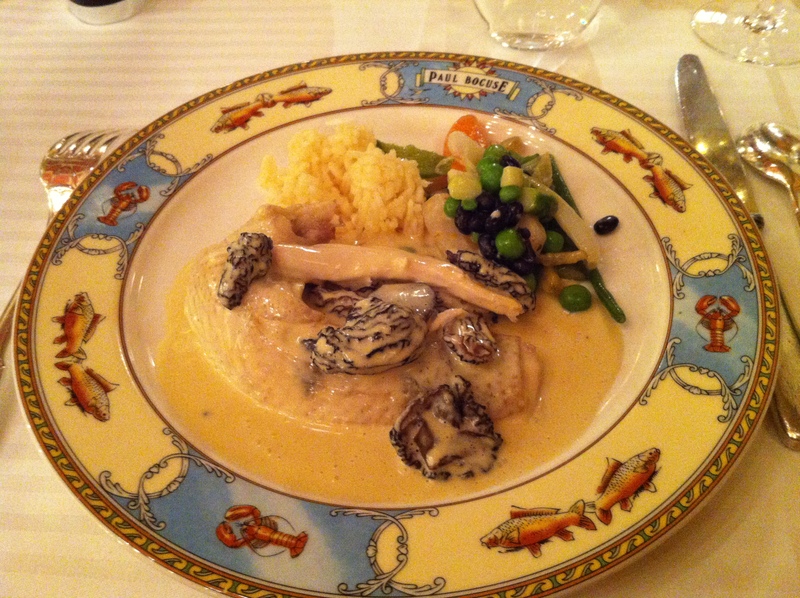 The chicken was carved up and served with a creamy sauce filled with morel mushrooms, and a side of rice and spring vegetables. After that we moved on to a “selection of fresh and matured cheeses from La Mère Richard“. 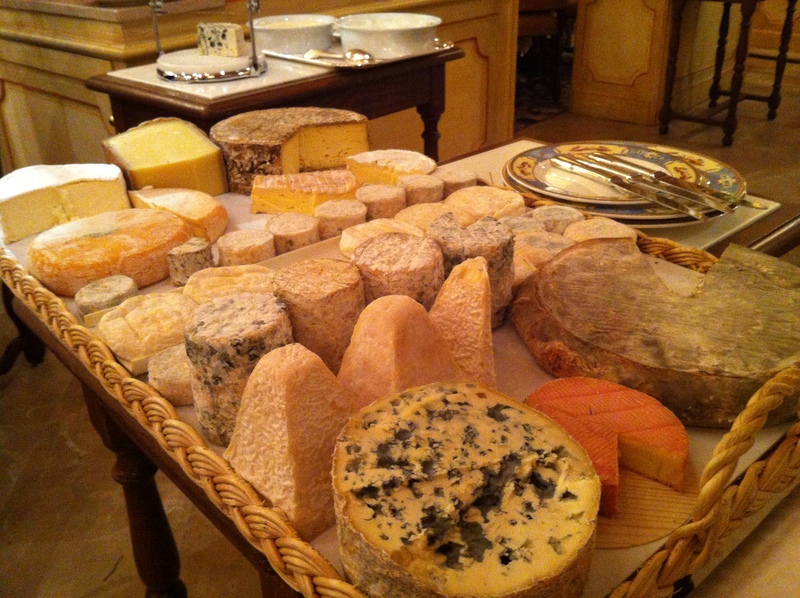 We were presented with a cart full of cheeses of various varieties and could select any that we wanted! Divine! 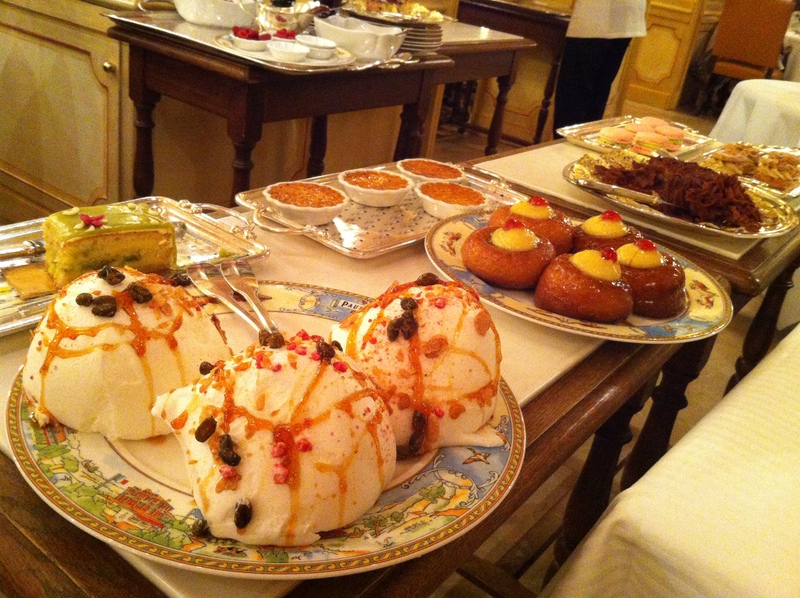 And then came the “delicacies and temptations”, which again involved a cart full of desserts that we could choose from. I went for the fruit, crepe and cream options whilst my boyfriend went for the sweetest items in the cart. Last item for us was the “fantasies & chocolates” which was a beautiful stand of chocolates and treats. Note the figurine on top of the stand (it’s a mini Paul Bocuse!). Overall, it was quite an experience. Very old school formal, classic dishes, excessive surrounds, immaculate service, luxurious feel throughout the whole experience. If you have the means and time, definitely do it. 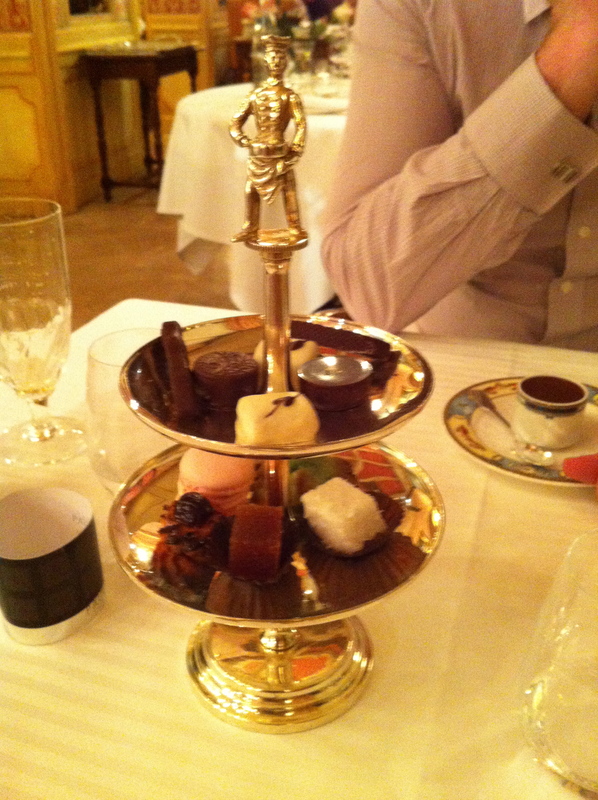 Being a lover of all things French, especially the food, this was a chance to live and breathe French gastronomy.